Let's see how to create a remote and secure data storage unit with high data availability, integrity, and confidentiality. The availability and integrity are provided by Amazon, while the confidentiality is provided by the cryptography explained here. I assume you know at least a little about what Amazon EC2 (Elastic Compute Cloud) instances and Amazon EBS (Elastic Block Store) volumes are, and that you have an Amazon Web Services account already. I also assume that you want to do this with Linux. Windows EC2 instances cost about 50% more, are much slower to deploy, and we can get better file system performance with Linux. The cost is certainly pretty good: US $0.10 per GB per month for storage, plus US $0.0052 per hour during the time we're have a nano instance running to access our data. This page has details of Amazon EC2. You can do the same thing on Google Cloud and Microsoft Azure, and in-house. There is no need to do this at a cloud provider. I'm just showing you multiple things on one page. With multiple partitions on your MicroSD card or external storage, you could do this on a Raspberry Pi. As for the availability, or the durability or reliability as Amazon also refers to it, Amazon predicts an annual rate of complete volume loss between 0.1% and 0.5% on EBS. Compared to an annual failure rate of about 4% for commodity hard disks, that's quite good. Periodic snapshots mirrored across multiple Amazon sites using their Glacier service can further increase the long term availability. Deploy an EC2 Linux instance and an EBS storage volume in the same Availability Zone. Attach that EBS volume. It will appear as either /dev/xvdf or /dev/sdf. Create encrypted block storage on that device, using the cryptsetup command. Access that encrypted block storage through the device mapper, so it appears as if it were the device /dev/mapper/storedev. This can only be done if you know the symmetric key used to create it in the previous step. From this point forward, we can treat /dev/mapper/storedev as if it were any block storage device. The dm-crypt kernel module transparently encrypts and decrypts all I/O. Create a file system on this device. Mount that file system as /secure and use it like any other Linux file system. The kernel will be transparently encrypting and decrypting all I/O. When you have uploaded your sensitive data, unmount the file system and flush the symmetric key from the kernel. 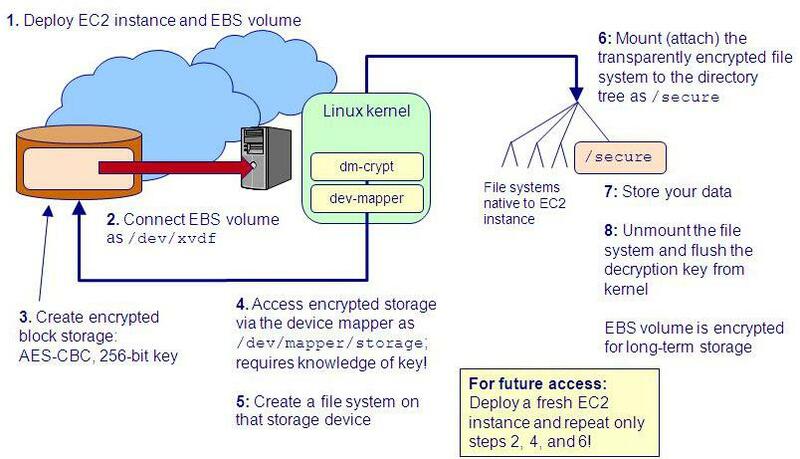 The EBS volume is encrypted for long-term storage. Future access just requires deploying a fresh EC2 instance and repeating only steps 2, 4, and 6 above. Start by creating a fresh EC2 instance. 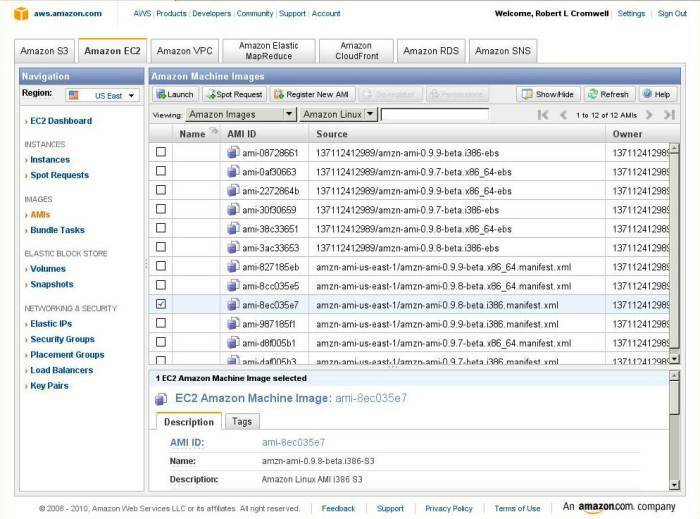 Sign in to Amazon AWS and click on AMIs to go to the AWS Management Console for selecting Amazon Machine Images. Not all Linux instances will support what we need to do. I had this fail on some Fedora based images, and then easily got it to work on the Amazon Linux images. Here you can see that I have selected the Amazon Linux images from the pull-down menus: "Amazon Images" in the first pull-down menu, and specifically "Amazon Linux" in the second. I have selected a rather light-weight one of those. We will only use the running instance for a short while. It just needs a recent enough kernel to provide the needed file system cryptography. Do make a note of the Availability Zone in which it is located. I arbitrarily picked the US-East region, and I will pick the US-East-1A Availability Zone. 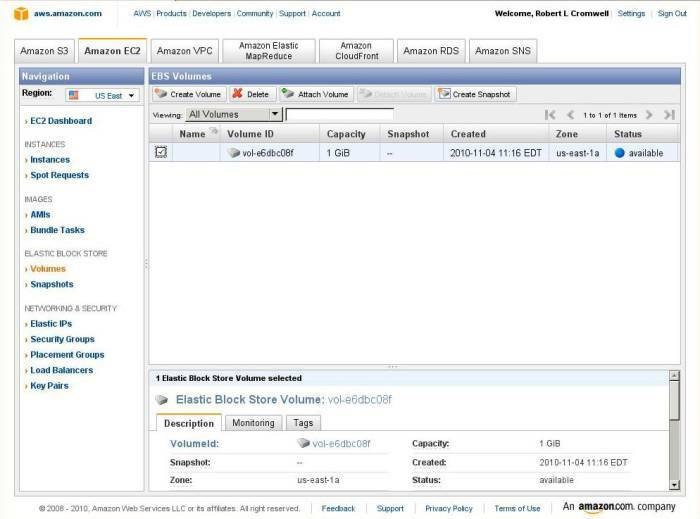 Once your new EC2 instance is coming up, click on the Go To EBS Volumes link to create an Elastic Block Store volume, or click on Volumes in the AWS Management Console. I just picked 1 GB, the smallest, for this demo. Make sure that you put it in the same Availability Zone as your running EC2 instance! EBS volumes do not become available immediately. This is because Amazon first replicates the new storage device (or the image thereof) across multiple devices within that one data center. Once it is truly available, you see it in the dashboard. This won't take a long time, but there will be a noticeable delay of a few seconds. I have selected it and am about to click "Attach Volume" to attach it to my running volume. Amazon Web Services are based on Xen virtualization. Remember that Amazon staff aren't really connecting a new blank 1 GB disk for you! The Amazon software is creating a new virtual disk image. The kernels of the Amazon Linux instances will probably recognize the newly attached device as a Xen Virtual Disk device, and the kernel will create the device node as /dev/xvdf and so on. That's block device at major number 202, minor number 80 and continuing by multiples of 16, if you care about that level of detail. This e-mail discussion at AWS addresses the device name variability. The Amazon Linux instances are set up so that root login is not allowed. You must instead use the ec2-user account. It will be set up for authentication using the key pair your specified when deploying that instance. You get the usual warning that the host's RSA key fingerprint is some random looking hexadecimal value. Since you're pretty sure of what's going on and you have no way of knowing what the host key fingerprint was supposed to be in the first place, answer "Yes" so it works. You will then get a warning that this machine's key, hostname, and IP address have been added to your list of known hosts, stored in ~/.ssh/known_hosts. You may want to clean that up when you're done with this. Here comes the ASCII art /etc/motd followed by a command prompt. Notice the different hostname and IP address indicated in the command prompt. The EC2 instances are behind a network address translating firewall, or NAT. OK, that's more like it. Now let's investigate the devices and mounted file systems. As expected, the storage devices are Xen Virtual Disk devices. If you see sdf instead of xvdf, then modify the following commands as needed. Well, that's support for just about everything! The only cryptographic kernel modules not included with this OS are those for pcrypt (a parallel crypto wrapper), salsa20 (a candidate stream cipher algorithm), and dedicated cryptographic processors (not really relevant on a virtualized platform). The two important ones for our purposes are highlighted above. This example had you looking at the kernel configuration file. It is possible that the stored is not exactly what was used to build the kernel. If the kernel was built to contain its own configuration, you could look in the file /proc/config.gz, which is actually a kernel data structure containing a gzip'ed version of the kernel's build configuration. If that file doesn't exist, maybe support was built as a module only. For even better information, browse through /proc/crypto to see further details. It appears that this platform has what we need. Let's set up encrypted storage. Set up the block device so that it contains an encrypted image. "Open" (or connect) that encrypted image. This makes it appear through the device mapper, a kernel module that can make one device appear as another (as used with logical volumes), or make a file appear to be a device. Create a file system in the "device" presented by the device mapper. So, lets start by setting up encryption on the attached storage volume. The -y option to the following command requires us to type the pass phrase twice. This is a good thing because mistyping it on a single instance leaves the device unusable. However, see the following discussion of the low entropy of English passphrases. Your most likely catastrophic failure will be a corruption of the LUKS header and complete loss of the stored ciphertext. Next most likely will be your choice of a guessable passphrase. NSA backdoors are a far less appropriate thing to worry about. While we could specify the cipher on the command line, we don't. The default is probably the most appropriate: 256-bit AES in Cipher Block Chaining mode with ESSIV. See the discussion here for why AES-CBC/ESSIV is the preferred cipher and mode. This will take what is entered as a pass phrase and hash it thousands of times with a randomly selected salt value to generate a key far stronger against cryptanalytic attack than the pass phrase itself. You would not want to use your pass phrase as the actual key. English text contains only about 1.1 bits of entropy per character. Entropy is randomness or unpredictableness. To take advantage of a 256-bit key space, you need a full 256 bits of entropy in the key. Face it, there is no way you are typing a pass phrase of 240 or more characters! I'll urge you to use a challenging pass phrase, but I'm a realist about just how large and complex it will really be. The raw encrypted storage is there. Now we need to make it useful as a device through the magic of the device mapper. Let's be modern, and use the Btrfs file system. We will create the file system in the crypto device, create a mount point, and mount the new file system. Then we'll make it owned by ec2-user so we can copy data into place. Back Up Your LUKS Header! Major cloud providers aggressively replace storage devices. Plus, your storage devices are really virtualized disks on top of RAID. Disk failure is not a concern at AWS or Google Cloud. Worry about your errors when logged in as root. What we're doing here increases our risk in a way. Many actions that seem quite reasonable can overwrite some data in the LUKS header and render the stored data permanently inaccessible. Backup the LUKS header as shown here. Then store backupfile somewhere safe, clearly labeled. Now, as for backing up the encrypted data contained in that file system, you need to make a choice. If you use tar or pax or similar to back up the file system, you are going through the kernel's dm-crypt module and making another copy of that sensitive data. You could use gpg or openssl or other utilities to encrypt the resulting archive. An alternative would be to make an image backup of the volume itself. Simply use dd to copy that storage device onto backup media. Of course, the resulting image will be quite large. And given the high entropy of ciphertext, it will not compress any. However you decide to do it, make backups and then verify that you can restore from them. And Now It's Ready For Secure Storage! Once you have your data in place, you need to unmount the file system and tell the kernel to close the encrypted device, a step that flushes the key from the kernel. Now would be the time to go to the Instances view and terminate your running instance. You've racked up a bill of US $0.06 for the running instance, unless you have been typing so slowly that it took you two hours and you owe a whopping $0.12. Create a new, larger, EBS, specifying it is based on that snapshot. Mount it and use it!